A new book that gives an account of the history of the Muslim community in Seychelles — from the arrival of Muslims as exiles to how Islam was consolidated on the island — was launched this week. “Muslims in Seychelles: A historical appraisal of their legacy” has been written by Seychelles-born Professor Abdul Fadl Mohsin Ebrahim. In addition to the history of the arrival of Muslims, the 186-page publication also talks about the different era that has characterized the 115-island archipelago. This spans from the time Arabs and pirates frequented the islands, the French settlement and British take over, the road to independence, independence itself, the coup d’état, introduction of one party state and re-introduction of the multi-party democracy. Speaking at the launching of his book on Wednesday, Ebrahim said it took six years to complete the project, adding that it was a difficult task. “I began in 2010 when my father was alive he was the first one I interviewed,” he said. Ebrahim, 65, was born in Seychelles but has been living in South Africa for many years. He told SNA that he also had to consult the Seychelles National Archives and relied on publications by other Seychellois authors to gather information to write the book. Ebrahim who has studied Islam and theology also holds a Master’s degree and Ph.D. from the Temple University in Philadelphia USA. 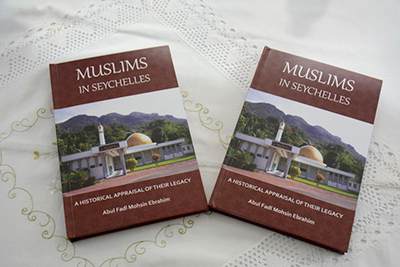 “Muslims in Seychelles – A Historical appraisal of their legacy” is in fact his seventh book but the first he has written on non-medical issues and the first about Muslims in Seychelles. Ebrahim’s previous publications is more about bioethics, which is mainly about concerns about the social, cultural, legal and ethical implications of progress in health. He explained to SNA that he developed an interest in this field while studying in the US. “In the states we are told we must be independent thinkers… I stepped out of my tradition to look at the problems being faced and I took an interest in bioethics from a very early stage while in the US,” said Ebrahim. His latest book was launched at the Sheikh Mohamed Bin Khalifa Al-Nahayan Mosque in the Seychelles capital, Victoria. This was in the presence of the former Seychelles President James Mancham who wrote the book’s foreword. The Muslim community is relatively small in Seychelles — representing around 1.6 percent of the population. Seychelles is a predominantly Christian nation with over 70 percent of the population belonging to the Roman Catholic faith, according to the national bureau of statistics. Afif noted that the Muslim population in Seychelles which stood at less than a hundred adults 50 years ago is today about 2,000. The book has been published by a local publishing company – imedia — of the VCS Group who has ventured into publications of books by Seychellois authors. “Muslims in Seychelles – A historical appraisal of their legacy” will be available in book stores in the near future and costs 200 Seychelles rupees [around $15]. Next: Patrick Victor Awarded Honorary Doctorate Degree.